Remember the experiment we started during the winter? Outdoor “snow” bokashi in clamped plastic bags? Well, it was a hit! It’s an uphill battle here to store ready-fermented Bokashi during the winter, four months of snow and nowhere to dig. Nowhere over zero degrees C for that matter either. So we tested soil bags outside. 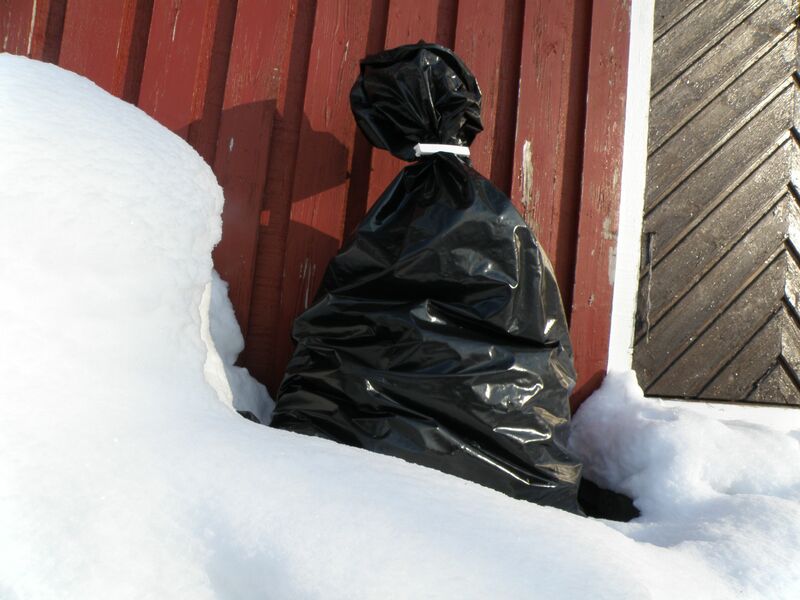 Take a tough black plastic rubbish bag and put it on a sunny wall behind the garage or outside the wood shed. Toss in a bucket of old summer-planter soil (or whatever soil you have handy) and a bucket of fermented Bokashi. Clamp with a plastic bag clip. When you have another bucket ready in the kitchen you can add it into the bag and reclamp. It’s good to add in autumn leaves, paper and cardboard scraps or anything else you might have handy; in the end it will all be good healthy soil thanks to the Bokashi. So we did all this and waited out the winter. Needless to say there are now a number of bags lined up, each one a thriving little soil factory now that the snow has melted and the spring sun is heating the bags. They need a bit of time yet (2-3 weeks?) then my plan is to tip them into the wheelbarrow and transport the soil off to a needy garden project. Any “undigested” bits can go into the compost or one of the other bags. My biggest worry was external factories: mice, rats, deer, foxes, the family dog. But after four months there wasn’t a scratch on any of the bags, it just wasn’t interesting for them. Which is truly great news. What this now means is that we now have a nice depot of ready-bagged super soil at our disposal. Certainly easier than lugging it from the local garden center on a crowded Saturday morning. And obviously you can’t compare the quality. Or the carbon miles. Another bonus we discovered along the way: you can reuse the soil bags that you’ve already lugged home from the shop. Open them carefully and if yours are like ours they’re black on the inside. So you turn them inside out and start filling. Next autumn I have a secret guerilla campaign planned. Instead of being depressed by how many villa owners put out sack after sack of autumn leaves outside their gate to be collected I’d like to go round and collect a few myself. They’d make a great start to the winter soil factory — ready filled with leaves, it’s just to add Bokashi and wait. Because waiting is something a gardener can’t avoid in the winter. And in spring we have so much else to do it’s nice to get a hand from a few billion busy microbes just longing to get working. Our winters aren’t as long and cold as yours, but the ground does freeze over, and then this is going to come in very handy. I’d be worried about too much liquid accumulating, I expect that’s why you added paper and/or cardboard? Yep! Cool isn’t it? I think this will be our standard winter approach now up here. Having talked it through with a few others who’ve been testing we agreed autumn leaves + bokashi (+ spring sun) is probably the best bet. The cardboard and paper really didn’t add much other than being a way of buying time (absorbing moisture basically) when I didn’t have any soil or leaves on hand. It would be fun to see some of the bags of leaves that people put out for collection put to some better use! A future guerilla campaign? I appreciate the innovation and lack of commercialization on this site.